Let’s start our analysis by first importing data in R using read.csv() function and then looking at its variables using View() function and summary() function. 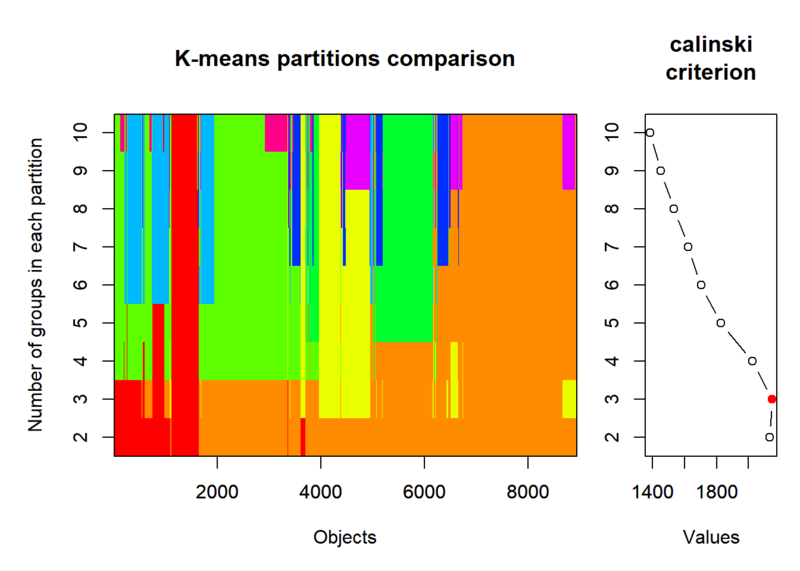 As you can see, there are missing values in the dataset, represented by NAs. So, here, we have to do missing value imputation by looking at the distribution of the variables which have missing values. One of them is CREDIT_LIMIT and other one is MINIMUM_PAYMENTS. We will have a look at the distribution by using the hist() function. The data is right skewed. So, here will will replace the missing values by the median of the variable. Now, let’s do the same for MINIMUM_PAYMENTS. The data is right-skewed over here also with skewness co-efficient very high. The values greater than 500 can be called as outliers over here. Let’s replace all the missing values with median in this case too. Now, we have done missing value imputation. We can see that we don’t require CUST_ID in our analysis since it doesn’t contribute much in our model. So, let’s remove it. Now, that we have done this, let’s do the outlier handling for this dataset.I will be removing those data-points which show dramatic increase or decrease as compared to other data-points. Mostly it will be on 1-2% or 98-99%tile level. It will serve two benefits: One being that this will not lead to too much of data loss. Two, the quality and accuracy of our clustering will increase. Outliers not only induce multi-collinearity, they will also disrupt the accuracy of our clustering by distorting the Euclidean distances. So, let’s move ahead. As can be seen, there are lot of outliers in this variable. There is a jump above 98th percentile. The plot is quite better than before.Let’s do the same for other variables. Having done outlier handling for all the variables, let’s now go ahead to do scaling of the variables. Now, first let’s do the cluster analysis using K-means clustering.For that first, we will find out the optimal number of clusters by Calinski criteria using the following code. From the plot and the statement, we can see that the optimal number of clusters is 3. Let’s now go for plotting elbow chart for the same. #calculate WSS of the data. From chart we see that the from 2-4, there is significant change in the graph. Also, calinki criterion says that the optimal number of clusters is 3. So, let’s stick with 3. ##  "cluster"      "centers"      "totss"        "withinss"
##  "tot.withinss" "betweenss"    "size"         "iter"
From aove code, we got the summary of the clusters and its important values. From here, we can see that in cluster 2, we have people whose balance is more on the lower side. In 3, we have more people having balance on higher side. In 1, we have people having balance in the middle range. In cluster 1, we have purchases amount in the higher range. In cluster 2, it’s more in the middleside and in 3, it’s on the lower side. In the same way, you can check the distribution of all variables on the basis of the cluster they are assigned to. So guys, with this I conclude this post. Please stay tuned for more such interesting case-study.